I haven't posted any O.P. Nayyar previously, which is odd as I have quite a few albums with his name on. And he's an interesting composer... he was among the first to focus on rhythm in an industry that up until the mid 50s had mostly been melody and song based. He was even known as The Rhythm King at one point if I recall correctly. 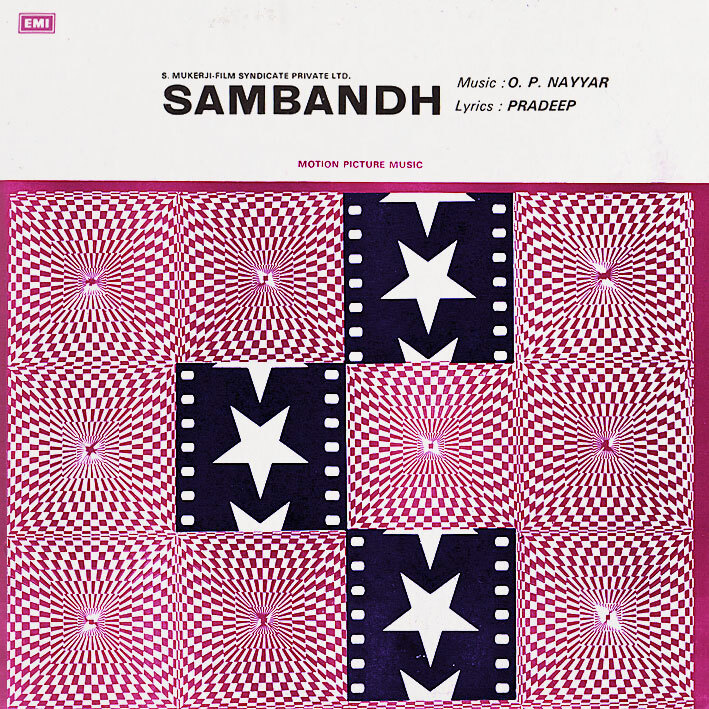 I don't think that's at all apparent on 'Sambandh' though; possibly one of his most famous scores but not a favourite of mine. It consists mostly of sad and slow-moving songs, more akin to the likes of Ravi than Nayyar's own earlier output. The exception is the film's hit 'Chal Akel', which in fact is the only track here I like. A bit. I'm thinking, therefore, that the other records I have by him will be better. faan man du er råå! Denne siden er et skattekammer av gamle klassikere og funkyness. Tusen takk for at du tar deg tid til dette. THE GREAT GAMBLER by R.D. Burman please. It would be great ! Thanks for this. OP Nayyar is one of my faves. Kashmir Ki Kali and Jaali Note are two I like best. And Harshi, Great Gambler will be coming up soonish.